Labor Day weekend in DC gave just a little preview for what is come this season in a few ways. events and hurricanes made us alter our plans. On Saturday we traded boating for Union Market. then grabbed a drink at The Bidwell at the end of the building. FYI the drinks are normal DC prices BUT they are strong and totally worth it. asked the bartender about it. It ended up being a sake from an Korea and was probably the grossest thing I've ever had. I finally got to wear this dress from The Fifth that has been sitting in my closet for a few months. I have been loving bodycon dresses for casual outings. adds more outfits to your closet. denim vest makes sure I keep the casual vibe. I'm wearing this Kendra Scott necklace backwards to create a lariat type look which is my favorite style at the moment. 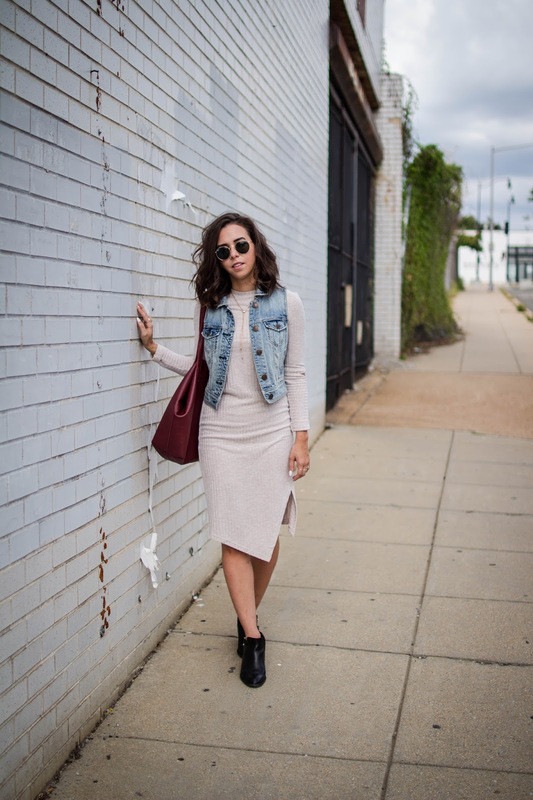 So obsessed with this look, hunting for a denim vest to throw over my long sleeve dresses! !